This method is a means of supporting you in a process of DIY “Personal Change Management” by introducing supportive fellow travellers. We offer various ways to help you begin your journey to becoming the best version of yourself. Change is inevitable. You can either be blown over by it or lean in and hoist a sail. Why manage the sail single handedly? We’re here to share the journey in 6 & 12 week facilitated groups. 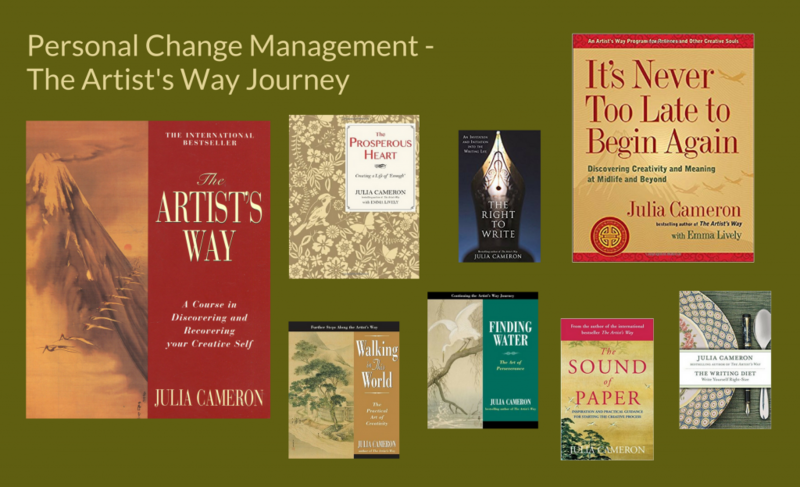 Additionally, Facilitated, Supported and Self Run Supported 12 week groups form quarterly covering many of Julia Cameron’s subsequent books. Additionally, all groups are conducted under the Chatham House Rule. How many half-finished self-help books are on your shelves? Don’t beat yourself up – we’ve all been there. You’re not the problem! Change is scary and fear is paralysing – so just don’t go it alone. Dublin, Belfast and on-line groups form quarterly. We’ve added Slane, County Meath this Fall – and will add a group between Dundalk & Banbridge as groups of 5 or more commit. Fall 2018 groups are run from September through November; use the form at the right to get in touch about our free information sessions.